My Review: I really liked this book. It is a great yarn about an extreme race, a circumnavigation if you will, of the state of Florida. Impossible you say? You can’t circumnavigate a peninsula! More on that later. 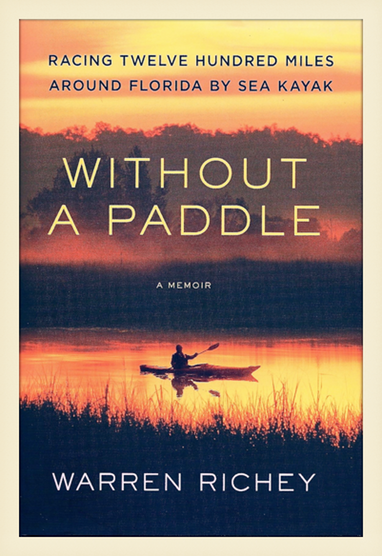 Part of the appeal of the book for me is that I met the author and heard him speak about the race – The Great Florida Circumnavigation Race. He does not look like a man who could accomplish the herculean feats necessary to be competitive in this race. He was mild mannered, soft spoken, funny, self-depreciating and a bit of a romantic. He was not a big man, nor did he appear exceedingly fit. Yet he managed to paddle sixty miles a day on average, spending sixteen to eighteen hours a day in his boat, with only about fours of sleep each night for almost three weeks. Another part of the book’s appeal for me was that I had paddled segments of the circumnavigation route. I was very familiar with these and other areas he paddled as well. I could really relate to the things he saw and the issues he dealt with. Who is this book for? This is basically, but not exclusively, a man’s book. But it’s not for every man. The author took on this race in his fiftieth year partly as a personal challenge and partly to escape from a painful divorce. Throughout the narrative he swings between the action in front of him and reflections on his failed marriage, his relationship with his son and his feelings about a new relationship. The thing is, I could relate to many of the deeply personal feelings he wrote about. I had experienced similar feelings at the end of my first marriage. So these episodes mostly added to the richness of the book for me. It gave me a greater appreciation of the author as a whole person. Still, the book is basically a story about a fast race around Florida and the fears and dilemmas faced. The author was filled with real and imagined fears about what he would face on this trip. So much so that he was given the nickname “Sharkchow”. I won’t tell you how the race ended in deference to the author’s wishes. But I will tell you that by the time he reached Jacksonville, he was one of the top three racers. Oh yes, that circumnavigation thing: You can almost circumnavigate Florida using the Gulf, Intra-coastal waterway, rivers and streams. There is just one “small” forty-mile stretch where racers must pull their boats out of the water and physically tow them to the next stream. Unbelievable. This is a great book. I highly recommend it. And if you ever have a chance to hear Warren Richey speak, do so. You’ll enjoy hearing some of the details of this incredible adventure directly from him. Footnote: Richey used two pieces of equipment on this adventure that I have no experience with; a jungle hammock and a deck mounted sail. I was intrigued by both, especially the hammock. BTW, he signed my book with this sentence: “To Don, The only thing better than being on the water is being on the water with someone you love.” I don’t disagree, but as I said earlier, he is a bit of a romantic.